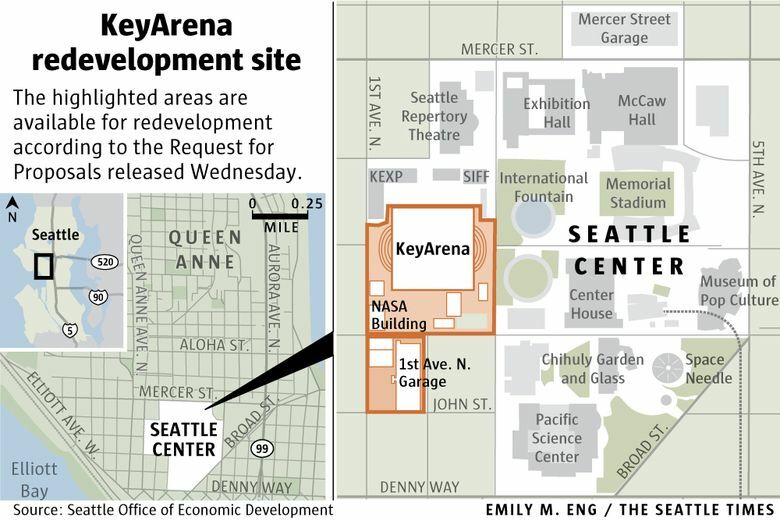 Seattle released a request for proposals for the redevelopment of KeyArena. The proposals are due by April 12, and two global arena companies based in Los Angeles have indicated they plan to apply. The city on Wednesday issued a Request For Proposals to renovate KeyArena for potential NBA and NHL use that calls for all-private construction financing and a lease arrangement with any interested developers. Under terms of the 25-page document, the city would maintain ownership of KeyArena, and any developer with an accepted proposal would pay a rental fee and assume all costs for maintenance and arena operations. The developer could sell naming rights for the upgraded venue as well as sponsorships and gain additional revenues via ticket sales and other routes. “The assumption is that the city would be leasing the facility to the entity that would invest in it,’’ said Ben Noble, city budget director. 1962: The Washington State Pavilion, designed by architect Paul Thiry, opens as part of the World’s Fair. Among its exhibits: The World of Tomorrow and the Bubbleator. Aug. 21, 1964: The Beatles play for 14,300 screaming fans. Tickets: $5. Two years later, they would play two sold-out shows at the Coliseum. Oct. 20, 1967: Seattle SuperSonics play their first home game in front of 4,473 fans. Jan. 15, 1974: Sonics host the NBA All-Star Game at the Coliseum. Oct. 13, 1978: Sonics move from the Coliseum and begin the first of seven seasons at the Kingdome. June 1, 1979: Sonics win the NBA title. Jan. 5, 1986: The Sonics return to the Coliseum for the 1985-86 season, and host the first rain-out in NBA history, thanks to a leaky roof. Feb. 8, 1987: Sonics host the NBA All-Star Game at the Kingdome. February 1994: Sonics demand the Coliseum be renovated. In exchange for the city issuing 20-year bonds to pay for the $100 million renovation, the Sonics agree to a 15-year lease. June 16, 1994: Construction begins to renovate the Coliseum. Sonics play at the Tacoma Dome during the 1994-95 season. June 1, 2000: The new Seattle Storm of the WNBA play their first home game. Attendance: 10,840. Oct. 12, 2004: The Storm beat Connecticut to win the WNBA Finals, bringing Seattle its first pro championship since the 1979 Sonics. July 18, 2006: Clay Bennett and a group of Oklahoma businessmen buy the Sonics and Storm for $350 million, pledging a “good-faith” effort to keep the team in Seattle. Jan. 8, 2008: Local businesswomen buy the Storm franchise. Feb. 11, 2008: Bennett offers the city of Seattle $26.5 million if it lets the Sonics out of the final two years of their lease. The city declines. April 13, 2008: The Sonics play their last game in Seattle, a 99-95 victory over Dallas. April 18, 2008: NBA owners approve relocating the Sonics to Oklahoma City by a 28-2 vote, with only Dallas’ Mark Cuban and Portland’s Paul Allen voting against it. Feb. 2, 2009: The Seattle City Council OK’s a decade-long KeyArena lease with the Storm. It’s possible, though unlikely, the 55-year-old arena could avoid historical-preservation status and be torn down and rebuilt from scratch. More likely, as the proposal indicates, developers should assume they must renovate the structure within the confines of its existing spine and iconic roof. Those submitting proposals, due April 12, must include a renovation plan within the existing structure but also can submit a full demolition and rebuild plan in case that option becomes available. The city says it expects to have a clear picture on the historical status of the building by the second quarter of 2017. All proposals must include plans to deal with transportation, parking and traffic issues and minimize the impact on the surrounding neighborhood. 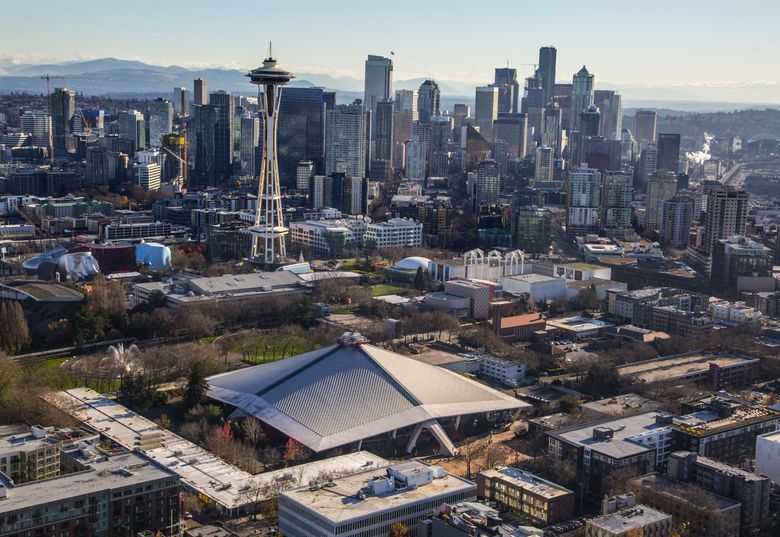 At the heart of the arena debate is the possibility of bringing an NBA team back to Seattle. The Sonics relocated to Oklahoma City and assumed the Thunder name in 2008. The NHL also has expressed interest in Seattle as a possible franchise destination. It says the area for redevelopment includes the existing arena, along with a parking garage along First Avenue North and adjacent parking and support areas on the Seattle Center campus. The decision to open up the arena process to include offers on the KeyArena site comes eight months after a Seattle City Council vote rejected the sale of part of Occidental Avenue South to entrepreneur Chris Hansen for a proposed project in Sodo District. Before that 5-4 vote, the city had said it could not discuss KeyArena options with interested developers because of a Memorandum of Understanding (MOU) with Hansen. That MOU expires on Dec. 3 of this year. Under terms of that deal, Hansen would have received up to $200 million in public-bond funding to build his arena provided he first secured an NBA team to play in the new facility. But the NBA repeatedly has said it is unlikely to open an expansion process before Hansen’s deal expires. Hansen agreed over the summer to allow the city to explore KeyArena options while he reworked a Sodo proposal with all-private funding. A number of groups have expressed KeyArena renovation interest the past several years, and — once the city opened itself to explore offers last summer — Anschutz Entertainment Group and the Oak View Group, a pair of Los Angeles-based global arena companies, said they would make proposals. Both also have said that — unlike Hansen — they would begin construction on Key­Arena before securing any teams. AEG President Bob Newman, whose company has managed KeyArena marketing since 2008, told The Seattle Times’ editorial board on Wednesday that internal studies have shown for years a renovation to NBA and NHL standards was possible. Those studies, he added, were buttressed by the 2015 AECOM architectural-firm conclusion that a renovation within the roof’s confines was doable. Newman added that the fact it’s an “arena within a park” makes it unique on a global scale and truly appeals to his company. Brian Surratt, director of Seattle’s economic development office, said the future of KeyArena always has been a “part of the story” around the city’s arena quest. Even if the Sodo project were approved, he added, the city would have to figure out KeyArena’s future as a city-owned asset. Surratt repeated the claim that the city remains fully behind Hansen’s proposal in the Sodo District. The city has yet to receive Hansen’s revised all-private offer, and Mayor Ed Murray has said all KeyArena proposals will be reviewed before shifting focus back to Hansen’s project. Murray also has said the only way the Sodo project can work is if Hansen finds a way to land teams. Hansen has said he cannot land any teams without first having a “shovel-ready” arena plan — which the city so far has been unwilling to give him. Geoff Baker: 206-464-8286 or gbaker@seattletimes.com. On Twitter @GeoffBakerTIMES. Daniel Beekman: 206-464-2164 or dbeekman@seattletimes.com. Twitter @DBeekman.